This magnificent 2.77-carat Old European cut diamond engagement ring is absolutely breathtaking. The solid 18k white gold shank is engraved with an elegant leaf motif. Tapering up toward the central diamond, the shoulders give way to a fancy crown head. The crown setting perfectly suits the majestic 2.77-carat diamond, graded L in color and VS1 in clarity, which rightfully takes center stage on this glorious Antique Old Euro Diamond Engagement Ring. The crown setting is perfect for solitaire engagement rings. 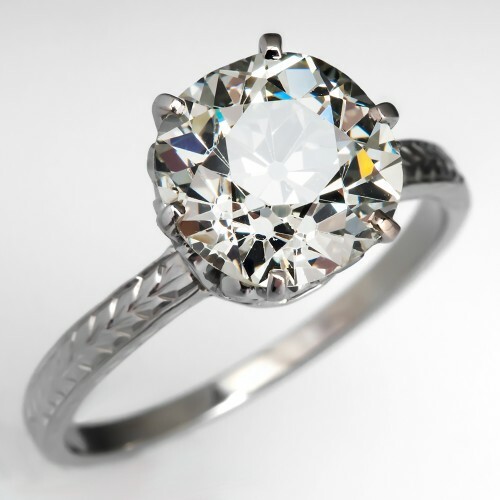 One of its primary purposes is to raise the central stone above the shoulders of the ring, allowing access to more light from nearly every angle. For this reason, it is often chosen by designers who wish to showcase a particularly fabulous diamond or gemstone. The crown setting is also preferred for solitaire stud earrings, as well. Crown settings were used frequently in the nineteenth century, for the reasons already mentioned. The crown setting provided a departure from the previously popular bezel settings. The introduction of more sophisticated faceting techniques, and the accessibility of dramatic diamonds coming out of the Kimberley Mines in South Africa, led jewelers to experiment with ways to keep the diamonds safe without sacrificing access to light. Thus the crown setting was born. In 1886, Tiffany & Co. inducted the crown setting as THE choice for engagement rings. With their invention of the classic six-prong diamond solitaire mounting, the crown setting took center stage for bridal wear. Even today, the crown-set diamond solitaire remains the most popular engagement ring style. The setting derives its name from its crown-like profile. Though their appearance is simple and classic, their function is far more involved. Beauty is essential, but even more essential is the security of the central diamond. A jeweler's saw is used to form the crown shape from the metal. This crown is then incised to firmly hold the girdle of the diamond in place. Finally, the prongs, formed of durable metal such as white gold or platinum, are pushed into place over the crown of the diamond. The diamond is absolutely secure while at the same time exposed from nearly angle to every light source available. Hands down, this gorgeous antique solitaire diamond ring is one of our most prized selections at this time. If you're in the market for a classic diamond solitaire mounted crown style, then may we entice you to come in and try this beautiful ring on?